Today's TJNL giveaway is sponsored by Club Stamp. 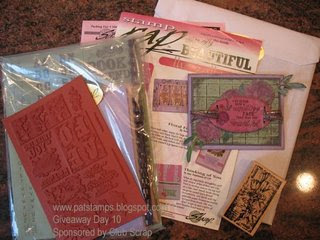 The kit in the Giveaway today is called "Simply Beautiful." In addition to the sheet of unmounted rubber stamps, there is a wood mounted stamp, 12 pieces of coordinating card stock, a "Scrap Rap" full of ideas, and as if that was not enough, a project kit to make an address book complete with directions. To enter the giveaway for today, simply leave a comment on Pat's blog entry telling her that you would like to enter by 11:59pm EST on Thursday, October 11. I would like to enter by 11:59pm EST on Thursday, October 11.